Simferopol is the political, administrative and cultural center of Crimea and is located in the middle of the Crimean peninsula. 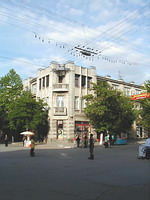 "Simferopol" is a greek word and means "a town-collector". Actually, all Crimean's roads collect in Simferopol. So whatever you would like to go in Crimea you should almost for sure visit Simferopol first. Simferopol was founded on April 28, 1784 after Crimea was joined to Russia by Katerine II. There was a small tatar town named Ak-Mechet. Till now downtown of the city consists of two parts: tatar and european, and you will easy notify the differences if you take a short tour around the city. Population of the capital of Crimea is about 400,000 people. It is quite a small and quite a big city at the same time. You can easily walk to any part of it in 40-45 minutes. Simferopol has a pretty large public transportation system, a big railway station, and an airport. You can get any point of Crimea from Simferopol. There is the trolleybus track (the longest in the World at more than 90 km) which goes from the airport to Yalta.